From RxISK.org: “James Moore on his Let’s Talk Withdrawal site has recently posted the following. The reason to reproduce here is that it seems to overlap so much with the Peter Gøtzsche Affair. […] In both instances we have an ex-Collaboration in one case and almost ex-College in another more concerned with their brand and business opportunities than with the integrity of the data or the wellbeing of patients. See what you think. 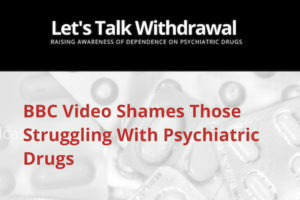 On Tuesday, November 20th, the Royal College of Psychiatrists participated in a video made by the BBC entitled ‘End pill-shaming in mental health.’ In the video, Hannah describes her experiences of enduring criticism for taking medication and being mentally ill. Also, the RCPsych President, Professor Wendy Burn, shares the story of putting a 70-year-old gentleman onto antidepressants. She compares it to physical illness and claims no one ever shames people with physical illness. Tell that to the people who have chronic pain and can’t get treatment because everyone on opiates is now just considered an addict and should just try harder to get better. I don’t watch BBC that much but I know American media never stops with the opiate crisis news to drum up support for the failed drug war and mass incarceration but almost never does a story on whats happening to people who suffer chronic pain.